Any dog could potentially have joint issues in their hips and knees, but sometimes small pups that were bred for certain qualities, like short legs, face more problems than other breeds. If you find your little canine limping, he may have a problem. Here are some of the joint issues veterinarians see most frequently. 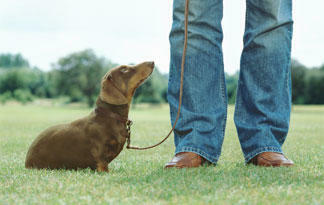 One occurs in the hips of small-breed dogs when they're 4 to 6 months old. It's called avascular necrosis of the femoral head and occurs when the blood supply to part of the hipbone stops. Doctors don't know exactly why this happens, but it's often easy to diagnose because it only occurs in puppies. Watch for your puppy having trouble walking or getting up after lying down. Two knee joint issues are common in small pooches, young and old. One is patellar luxation, a birth defect where the kneecap pops out of the groove in the thighbone where it normally rides, causing the knee to lock and the dog to skip or hop. The other is cranial cruciate ligament rupture (or disease), which is injury or gradual wear to the ligaments around the knee and will cause limping. For both, surgery is often required to prevent the joint's condition from worsening over time. Some dogs, like dachshunds, bulldogs and basset hounds, belong to a group called chondrodystrophoid breeds, which means they're genetically predisposed to some joint and cartilage disorders. They may develop elbow incongruity, which is when one leg bone stops growing before the other. The elbow won't fit properly, and simply walking can cause pain and limping. Can you help your dog avoid joint disease? Unfortunately, many joint issues are unavoidable since they are genetic, and some will require surgery, but preventative health and early intervention can help. Number one is keeping your dog's weight under control so that his joints are put under less stress. Your dog also needs to exercise, but in moderation. Walking and swimming are recommended -- jumping after Frisbees or sticks may make a condition worse. Your vet may recommend non-steroidal anti-inflammatory drugs to soothe the joints, or over-the-counter supplements like glucosamine and chondroitin to prevent joint degeneration. You can also take actions around your home, like keeping your dog away from slippery surfaces (a fall can exacerbate an already injured joint) or preventing her from jumping by keeping her away from taller furniture or helping her get up and down. See your vet if you're worried about your dog's joints. If your dog limps or has trouble moving after strenuous exercise, he may just be a little sore, but he should improve after resting a few days. If he doesn't want to get up at all, all four legs might hurt. If he can't put any weight on his leg, make an appointment right away. Although some small dog breeds are more prone to certain joint problems, not all small dogs will have them! Every breed has its issues, but an educated owner makes a great owner.